The new sensory room at Ridgeway Primary. Ashley was on hand in his role as a Ridgeway Governor to see the opening up of a new Sensory room at Ridgeway Primary. 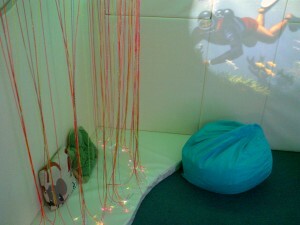 A sensory room is a special room designed to develop people’s sense, through special lighting, music, and objects. It can be used as a therapy for children with limited communication skills and will be invaluable to pupils at the school. The project was funded by the charity Wooden spoon and was officially unveiled by London Irish star Tom Homer. This entry was posted in Ward School News and tagged Ridgeway Sensory room on September 30, 2014 by Ashley Pearce.